So who is Archibald Beatty, Farmer, father of James Beatty of Aghavoory? I’ve now updated the chapter: “The Beattys out of Ireland” in the family story to include all the latest information I have about the early generations of our Beatty family. The Colebrooke Estate records at the Public records Office of Northern Ireland (PRONI) didn’t go back quite far enough to tell me where our ancestor James Beatty (1797-1873) came from before taking up farming at Aghavoory townland just south of Fivemiletown, Co. Fermanagh, sometime before 1829. They did tell me the year he died, so here is his death record. 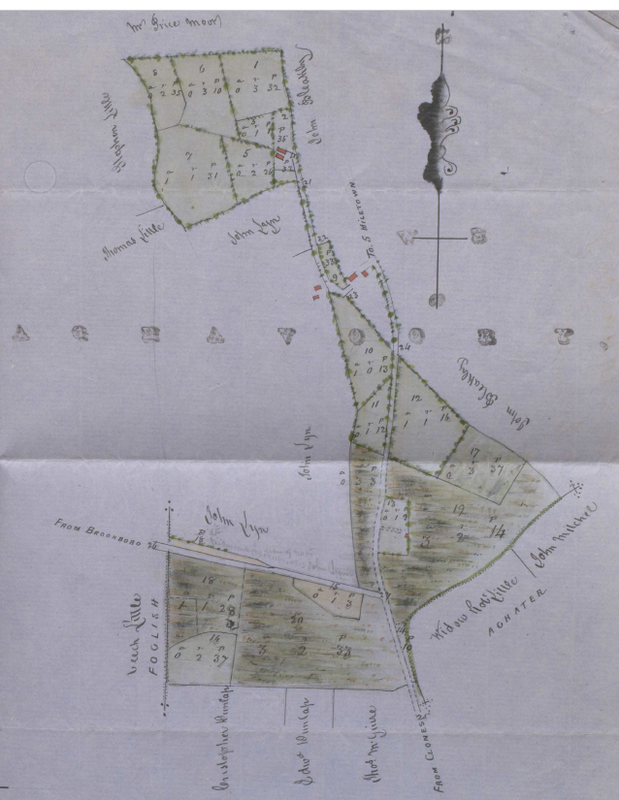 They also showed that the land which James later farmed was leased in 1787 to a Robert McKnight, then aged 32, and that that name remained against James Beatty’s Aghavoory land in the Colebrooke Estate rent book until November 1865 even though James Beatty paid the rent. The original Robert McKnight would have been aged 105 by then. Maybe it was sublet to James by the McKnight family all that time? There seems to be no surviving lease for Aghavoory in James Beatty’s name, even from 1865. So who was Archibald Beatty, Farmer, who was given as James’s father at his (second) marriage? We know from genetic testing that we are very closely related to the Beattys of Farnamullan. The YDNA tests indicated a 70% probability that Charles Beatty (1725-1798) of Farnamullan was the common ancestor between our family and descendants of the Farnamullan Beattys. I’m told that analysis of “BigY” tests using the same DNA samples gives an even stronger indication that either Charles or his father must be the common ancestor. I confess that I don’t really understand “BigY”. As mentioned in earlier posts, Charles Beatty of Farnamullan had a son Archibald Beatty (1758-1831), who married Martha Moore of Aghavoory in 1792. Their second son was a James. It was the coincidence of Martha Moore being from Aghavoory that compelled me to visit PRONI in Belfast. It’s now confirmed that our James was born in 1797. This is the perfect date to be the second son of a couple who married in 1792 and had 8 children right? The order of Archibald’s children (but not their birthdates) is given in a transcription of a document whose original is lost. The birthdates of the two youngest children are known from tombstones, indicating that Martha had at least 2 children in her forties. The ages at death of Archibald, his wife Martha and their eldest son Charles who died young come from the transcription of a tombstone, very faint when transcribed, which has since been lost. According to the transcription, eldest son Charles would have been born in either 1805 or 1800 – too late for our James to be his younger brother. But if this birthdate is correct, Archibald and Martha had no children for at least 8 years after their marriage and then had 8 children when Martha was aged 36 to 48. It makes much more sense to me that a date on a barely legible tombstone was transcribed wrongly and they began having children soon after marriage as is normal! There was no mention of their second son James having died young, so where did he go then?? In short, I haven’t given up on Archibald Beatty (1758-1831) of Farnamullan as the father of our James after all, although there is still no proof. If this Archibald is not the one, and we take the genetic test results seriously, then we’re probably looking for a son Archibald of a hypothetical brother of Charles Beatty (1725-1798) of Farnamullan who would need to have been about the same age as the above Archibald; have married at about the same time and also have a son James. There weren’t as many Archibald Beattys as there were James Beattys, but of course he could have lived at any townland in Fermanagh, and the further back you go the sparser the already sparse Irish records get. Sigh! I think I’ll leave it at that for a while! As it happens, I’ve suddenly found out what I came over here to establish – in a way. We had hoped that our ancestor James Beatty of Aghavoory was the son of Archibald Beatty of Farnamullan. DNA testing had indicated that it was highly likely (our DNA being practically identical to a descendant of the Farnamullan Beattys). The Farnamullan James Beatty was born in 1807. At PRONI in Belfast last week I found that our James Beatty died in 1873 – when the Estate Manager wrote DEAD beside his name in the Colebrooke Estate rent book. Today I got his death record from GRO Dublin. Due to the number of James Beattys it took a couple of goes and he turned out to be 10 years older than I was expecting. Anyway, James Beatty, Farmer, aged 76, married, died of Bronchitis at Aghavoory 14 Nov 1873. His eldest daughter Matilda Robinson of Breandrum was the informant. This means he was born in 1797 and is 10 years too old to be the son of Archibald Beatty of Farnamullan! Back to the drawing board. [4/5/2016 Not so sure about this now. See next post] We know that the families must be connected in the preceding generation or two, but how? One good thing about this is that it makes sense of something I was told while visiting Aghavoory and Agheeter . Tommy, who apparently knows the whole history of all the local families for ever, and who knew James’s grandsons, assured me that James Beatty had come from Breandrum. So now we’re looking for an Archibald Beatty of Breandrum mid to late 1700s. As Pete says: The hunt continues! I’d had enough of Belfast, so dragged my chattels down to the bus station through the rain and got on the next bus to Enniskillen. The weather changed from warmish and sunny to rain and sleet five times in the hour and a half it took to get here! So here I am in actual Fermanagh, in a little motel room where I can cook my own dinner (bought ravioli and pasta sauce!) and enjoy a glass (or 2) from my own bottle of (Chilean) wine for the price of one glass in the pub. Today I learned as much as I could about farming in mid 19th century Fermanagh. This is the description which goes with the map of James’s land in the last post. He has 15 acres of arable land, 13 acres of “heathy pasture” and 3 acres of “whiny pasture”. The latter I’m told, means covered with gorse (currently in vivid golden bloom) not much use for anything. James, with 60 acres before he split his land with his eldest son Joseph in 1855, and with 33 acres thereafter had a relatively large holding for a farmer at the time – the average was 15 acres I’m told. He can’t have just grown potatoes, as was scornfully suggested by one of his descendants! The “arable” land could well have been used for various crops, but, I’m told, would have grown enough potatoes to sink the Titanic! The “heathy pasture” was probably used for cattle. 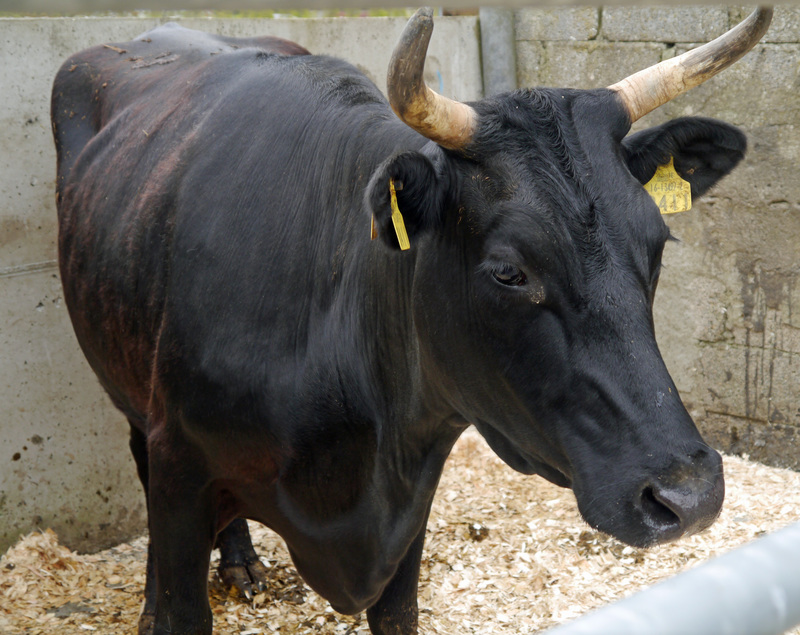 The contemporary newspapers report frequent sales of “black cattle” at the local markets. Sean thinks these were probably the same as “Kerry c0ws” (Sean says “a lot of Irish things get called “Kerry””). I gather that both of these terms refer to the cattle that were around in Ireland before they decided that there should be “breeds” of cattle – cattle breeding as such was something the gentry later got into. James’s farm would certainly have produced milk, butter, eggs and everything else they needed to subsist and earn enough to pay the rent every six months. They may also have had sheep, pigs or goats. It’s also clear from the survey maps that during James’s time an orchard was established. Tomorrow. I’ll go there. I’ve been crook with a pretty savage flu for the last few days, and even spent the weekend in bed watching silly movies on TV! Today I feel better enough to venture forth, albeit with a lot of coughing and trying to keep away from others as I’d hate to pass it on. Luckily today is Monday when the archives are open again. Belfast continues bleak and rainy. I’ve given up trying to find good coffee – I can’t taste anything at the moment anyway, but the pubs are warm, friendly and very atmospheric. No, I haven’t been able to prove that our James Beatty of Aghavoory is the same person as in Pete Beattys’ tree, although it’s still highly likely that he is. I’ve learned a couple of other things about him though. His land in Aghavoory had originally been leased to Robert McKnight in 1787, so it did not belong to the Moores although it adjoins their land. It has been suggested to me that (if it is the James Beatty born in Farnamullan) he could have married and needed land of his own before his father Archibald was ready to hand over Farnamullan and no leases were available near Farnamullan. However, if a parcel of land came available next to his uncle’s farm in Aghavoory, the Moores could have recommended him for it. James Beatty paid the rent on that parcel of land without the name being changed from McKnight and I don’t know why, but I can’t find a lease in his name. James also had 33 acres in Agheeter townland. When James’ own eldest son Joseph married in 1855, James gave him the Agheeter land – well in the rent books the name changed from James to Joe Beatty. His younger sons, Archibald and James (that we know of) must have been encouraged to make their own way. They certainly did. Unfortunately Farmer James wasn’t a noticeable tenant. He paid the rent exactly on time every time. The Estate Manager’s note book is occasionally entertaining reading as he threatens to evict miscreants who mistreat their wives, take over land without the Estate owner’s permission, build houses other than where they were told to, or (horror!) with thatched roofs. On the Colebrook Estate everything has to be “slated”! James Beatty never gets a mention, presumably because he never did the wrong thing. We now know that he remarried in 1858 though I still haven’t found out the name of his first wife. In the Colebrook Estate rent book for May 1873, there was a note against his name “dead”. Even knowing the year of his death, I still can’t find a will. Enough for today. I’m off to the pub for dinner! After a wonderful diversion via Bolzano, Italy and Innsbruck, Austria, I’m actually here in Belfast. I’ve spent two days at the Public Records Office (PRONI) now. I’m afraid Belfast strikes me as rather bleak and grim, though it could be mainly that PRONI is in the Titanic quarter where the extensive shipyards used to be, largely a wasteland now, with a huge new stadium, flash new PRONI, and (yes, they built it here) the Titanic museum. My hotel is very comfortable with a view over St Anne’s Square in the Cathedral Quarter, over the river from PRONI. All I’ve done so far (apart from persuading KLM to find my suitcase which they left in Amsterdam – it did turn up, 24 hours after I did) is work all day, and in the evenings try to find a cheap dinner. So far the pubs are best. After two days I’ve worked out the system at PRONI, but haven’t made much progress yet towards establishing the relationship between Archibald Beatty of Farnamullan and James Beatty of Aghavoory. There are certainly many thousands of documents in the Colebrook Estate records, but most of them are after 1850 and too late to tell us which Archibald Beatty was the father of James of Aghavoory. I’ve found a couple of coloured maps of James’ farm, so if I go to Fermanagh I should be able to see if the birthplace of James Beatty of Ballina/South Yarra (1842-1903) is still there. I was going to put one in to add colour to this post, but I’m too tired to work out how to convert it from PDF and I don’t have the “snip” tool that’s on my computer at home. I found one map of Aghavoory from 1787 which could have been very useful. It shows Mrs Moore at farm No 1, which was leased by Price Moore in the 19th century. It also shows 4a and b and 10,later leased by James Beatty, but they belong to a Robert McKnight, so we still don’t know how James acquired them. Genetic DNA testing pays off after all! 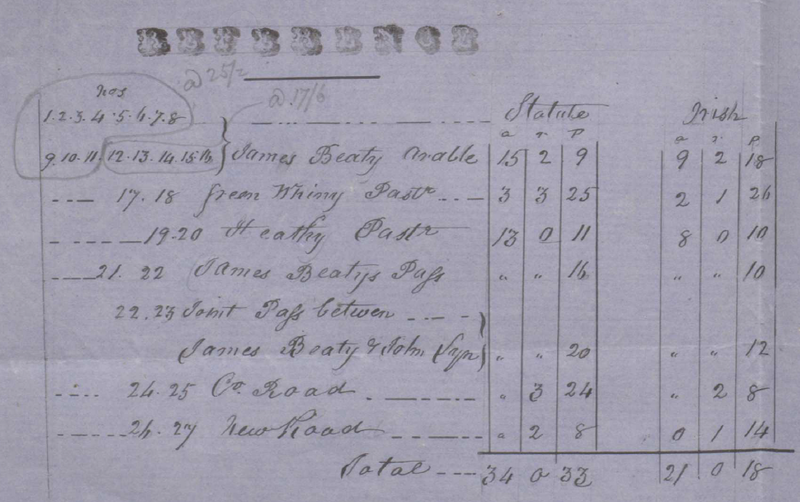 Firstly, I had a good look at James Beatty, Farmer of Aghavoory, Fermanagh (c1810-Aft 1875) now that we know more about him (for example that his father was a Farmer called Archibald Beatty), and can see that he must have been born about 1807, earlier than I had thought. The earliest mention of him (so far) at Aghavoory is in the Enniskillen Chronicle 14 May 1829, listing persons in Fermanagh who have registered their freeholds to establish their qualification to vote at elections. Probably at the time you’d also need to be over 21. Secondly, on the basis of our YDNA111 tests, there’s a 70% probability that the Grandfather of James above will be our common ancestor with the person whose test results are closest to ours of those tested so far. We* both also carried out “Big Y” tests whose significance I don’t really understand, but am told that we share a mutation that makes the relationship even more likely. Pete has been researching this family for many years and has an extensive tree of Beattys in Fermanagh. In his tree is a Farmer Archibald Beatty of Farnamullan townland (1758-1831), whose son James Beatty born c1807 disappeared off the genealogical radar. Pretty interesting eh? Furthermore, Archibald of Farnamullan in 1794 married Martha Moore who was from Aghavoory townland! It’s hard to believe this is a coincidence – there are 2,294 townlands in Fermanagh! I’m guessing that James, who was the eldest surviving son of Archibald, inherited the lease on the farm at Aghavoory from his mother’s family – I understand that leases could be inherited? Leaving his younger brothers to inherit the Farnamullan lands. I spent a few hours spreadsheeting all the Archibald Beattys in Fermanagh at the time, using every mention from the usual online sources, and as far as I can tell, only two are likely candidates to be the Farmer father of James of Aghavoory, one of whom is Archibald of Farnamuallan. This is so exciting after all these years of facing our Beatty brick wall that I’m booking plane tickets to Belfast for next week. Aghavoory townland was on the Colebrook Estate of the Brooke family, one of the few estates whose papers survived. The papers are in the Public Records Office of Northern Ireland in Belfast. I’m hoping to spend a few days combing through them for clues about our family, and hopefully some proof that Archibald Beatty of Farnamullan was the father of James of Aghavoory. I’m sure to end up very knowledgeable about 19th century farming practices in Fermanagh at least! And the common ancestor, if all this can be established, the father of Archibald Beatty of Farnamullan, was Charles Beatty (1725-1798). We know that name! *Not my DNA of course! I borrowed some from a sibling with a Y chromosome! Beattys back to the Eighteenth century!!! Firstly, I’m making it official that James Beatty of Ballina was in fact the younger brother of Archibald Beatty of Ballina. I ask you, why else would two young men, both from Fermanagh, both of whose father was James Beatty, Farmer, both appear in Ballina, Co. Mayo at about the same time and share a house there if it isn’t because they’re brothers? There just isn’t another sensible explanation, even apart from the name Archibald occurring in the next generation of our family – SO, moving on. Ignore the spelling of the surname, it is certainly James Beatty of Aghavoory, WIDOWER. Ignore the given age of 22 also, couples didn’t usually give their ages, the convention at the time was just to say if you were over 21. 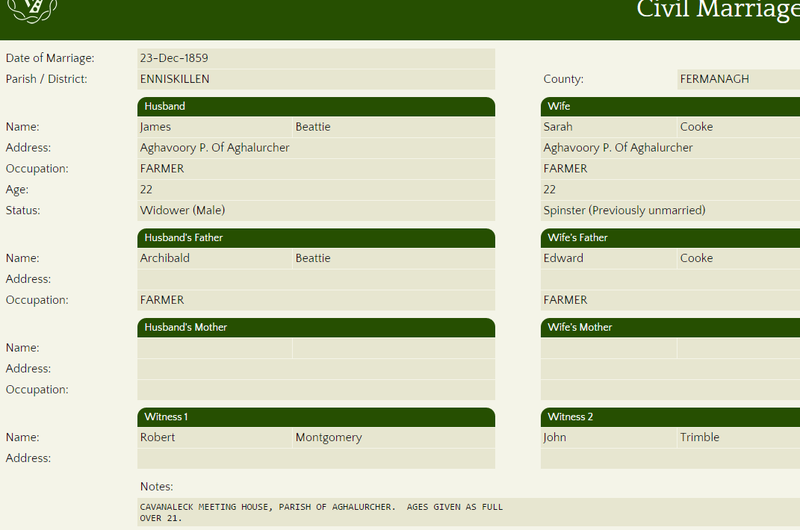 The really exciting thing is that since this marriage occurs in the civil registration period it gives the name of Farmer James’ father – long dead no doubt – another Farmer, Archibald Beatty who would certainly have been born in the 1700s 🙂 🙂 No wonder Sarah and Margaret sounded unfamiliar. Our James and his brother Archibald would hardly have known them. I wonder if it was a coincidence that they both left for Ballina the following year? Maybe young James – only about 17 at the time – didn’t feel so much at home at the Aghavoory farm after his father’s remarriage? Unfortunately we still don’t know the name of Farmer James’ first wife, our gg grandmother, and we may never know. I BET it was either or both of Emma and Matilda though – the name of our James’ eldest daughter!